I have some friends who spend three to four hours a day on Skype. It has changed their lives. Family and friends who live far apart now see each other on a daily basis. It has truly changed the world of communications. It’s popularity just keeps growing. The Internet calling service just announced that it connected 70 million people through its Internet calling service at once. That number is mind boggling. I try to imagine all those people talking to each other at once. Kind of like the scene in Bye Bye Birdie. 1) The average time spent on a Skype conversation is 27 minutes. 2) Active Skype users spend 100 minutes a month on the service. 3) Thirty five percent of small businesses use Skype as a primary service. 4) Forty percent of all Skype calls use the video feature. 5) Microsoft bought Skype in 2011 for $8.5 billion. Just 10 years agoonone million users used the service at once. 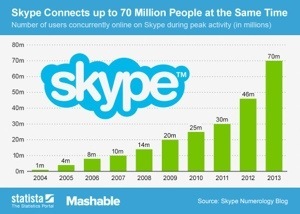 In 2011, 30 million people made Skype calls at the same time, which is less than half the number concurrently connected . This entry was posted in digital, senior lifestyle, tech and tagged Microsoft, Skype, Statista by loiswhitman. Bookmark the permalink. Wow its been that long already? I used Skype almost everyday before the security issues. Now that it is all fixed up (hopefully) I’d like to use it again. Congrats to Skype and to you too for doing a good job on sharing such a wonderful post.